Years ago, Bob Brister remarked, “The only thing more expensive than the antimony is the alimony,” or words to that effect. In October, 2016, there was an eleven page thread eruption on the subject of lead shot hardness. As usual, it is hard to tell who exactly is trying to say what, which is inevitable with fake and assumed names. The nominal shot diameter for #7-1/2 shot is .0950 inches. SAAMI voluntary performance standards target shot are allowed a diameter tolerance of plus / minus .0050 inch. 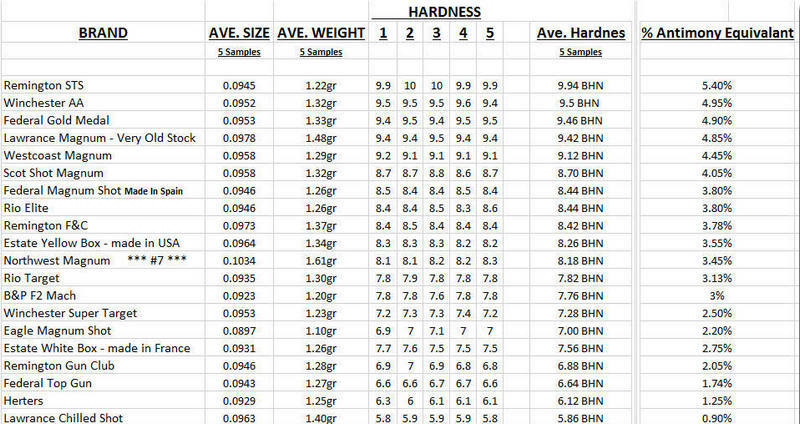 As you can see, there was a clear winner in the hardness department. Based on this independent testing, Remington STS shotshells have the hardest shot on the market with an average Brinell Hardness Number of 9.94.The Remington shot tested came right out of new box of Nitro 27 shotshells. Every year, Neil Winston (claytargettesting.com) obtains a couple of boxes of every shell available on the first day of the Grand in the shell house on the grounds at Sparta. Some pattern more efficiently than others. Neil's testing also demonstrates why one pattern does not mean anything. 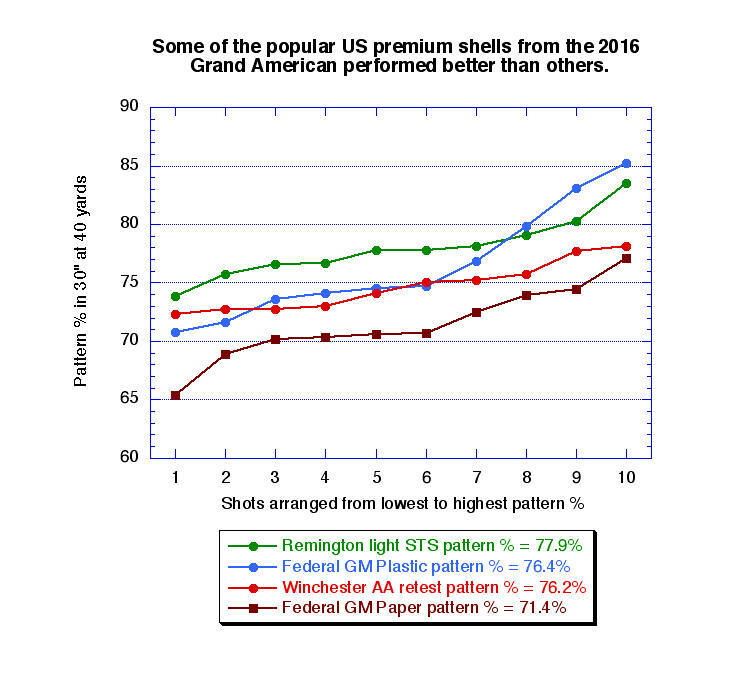 One pattern from a Federal Gold Medal Paper gave a weak pattern percentage of about 65%. Yet, the same shell also did 77%. The Federal Gold Medal Plastic produced the single highest pattern percentage of shot of about 85%. It also threw a just-under 71% pattern. It in both shells, the pattern varied by 14% or so. Both the Winchester AA and Remington STS shells were more consistent, with the Remington STS loads having the highest efficiency patterns on average. Unsurprisingly, STS lead #7-1/2 shot, which won in the Micro Vickers Hardness testing also produced the best patterns.